This latest Duelist Portfolio features the legendary Duelists Yugi and Kaiba, along with the mysterious antagonist Aigami, all from the latest Yu-Gi-Oh! feature-length film releasing in 2017. With the secure side-loading design, this 10-page portfolio has 9 pockets per page - by placing cards front-to-back, you can stage up to 180 cards of your prized cards. Along with an anti-slip feature to keep cards secure in the pockets, you'll want to dazzle the crowd with your own Yu-Gi-Oh! 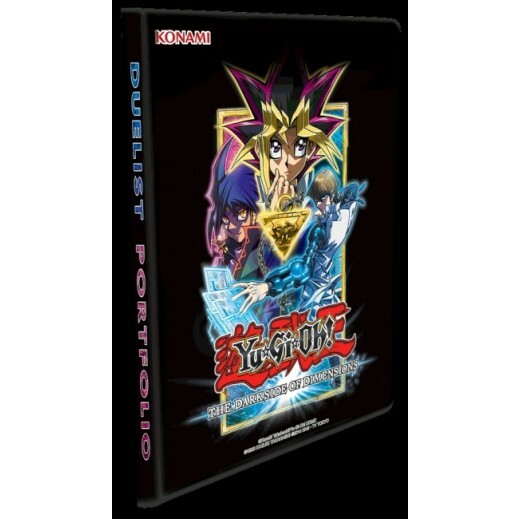 The Dark Side of Dimensions 9-Pocket Duelist Portfolio!